Chocolate biscotti reminds me of chocolate cookies I had as a kid, like Oreos and chocolate sugar cookies. I use a good amount of fair trade cocoa in this recipe, but you can probably go with a bit less and still get delicious results. Although you don’t need to add much to these, some nuts or chocolate chips make a great compliment to the crunchy, chocolaty goodness. Dunking in a cup of tea or coffee works too! This recipe is almost identical to the Basic Biscotti recipe, except that I add cocoa. Another optional addition is a teaspoon of muscovado sugar for a bit more sweetness and a sugar crunch here and there. In a bowl, add the butter, honey, eggs, and vanilla, and beat until well blended. In a separate bowl, add all the dry ingredients and mix until well blended. Add the dry mixture to the wet mixture and mix again until well blended. dimensions you want your biscotti to have when finished. What kind of almond flour do you buy? Where do you get it? Our coop only sells Bob’s Red Mill almond flour/meal. I buy mine from Hughson Nuts. They shouldn’t fall apart. Did you add the eggs (which binds them together)? You can cool them forever and then reheat them – shouldn’t make a difference. Yes, I had two extra large eggs in there. All I can think of is the moisture contents of the other ingredients was off, maybe not high enough? My almond flour was in the freezer so it may have become extra dry also my honey has to be cut out of the jug (I get local honey in big containers, this is from last year.) Then I did throw in a handful (about third cup) of organic flaked coconut so maybe that was the variant it didn’t like. Also, my local humidity varies widely and it is hard to gauge whether I need more or less moisture on any given day. The chunks that I have though are Delicious! They’re still getting eaten, just not something I could give away yet. Thanks for your quick reply! oh, the coconut probably did it. Coconut soaks up moisture really well – too well. It probably dried it out. Maybe some more eggs would help? I added a 3rd egg – I use stevia for baking as the sweetener. The batter was a bit too dry without the honey. Thanks for posting and for all your recipes! You make eating low carb easier. Thanks for letting me know your changes! I love to hear about them. Happy Holidays! I made these for my Saturday morning group and they were a big hit. I substituted instant coffee powder for the cinnamon, and included chopped almonds. I live at 1,700 feet so I ended up baking the loaf for 30 minutes and baking the slices for 45 minutes. 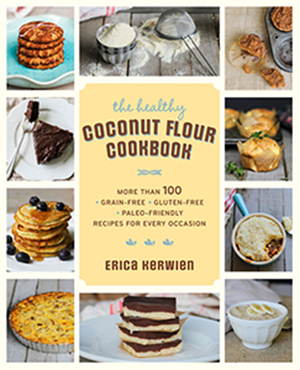 Thanks, Erica – your website is my go-to for SCD and gluten free recipes ! Thanks, Carol! So nice to hear. Love the coffee powder addition! Yum.